Today, I start a new series of articles simply labeled, “Why Microsoft”. Why? Well, primarily because I have gotten tired of trying to rationalize why Microsoft does some of the things they do. I will do my best to keep things “objective”, without inserting my snarky “subjective” opinions. Why don’t I just use one of those wish list apps or blogs that Microsoft has created to collect users comments and feature requests? While some of the threads do have meaningful, objective, rational purposes. Most are simply one users, or in some cases many users, subjective view of how the world should revolve around their thoughts. Oh, and I have a login for Mobility Digest, so I don’t have to. Ha, ha. I figure if I only post one “Why Microsoft” article a week, I already have enough to last a lifetime. And as I plan to live to at least 110, that’s a lot to keep the folks in Redmond busy. I welcome my colleagues to offer up their own “Why Microsofts”, as well as you the reader. Drop a comment, and if after vetting your observation (Trust, but verify), I’ll feature your thoughts in a future article. So here goes. 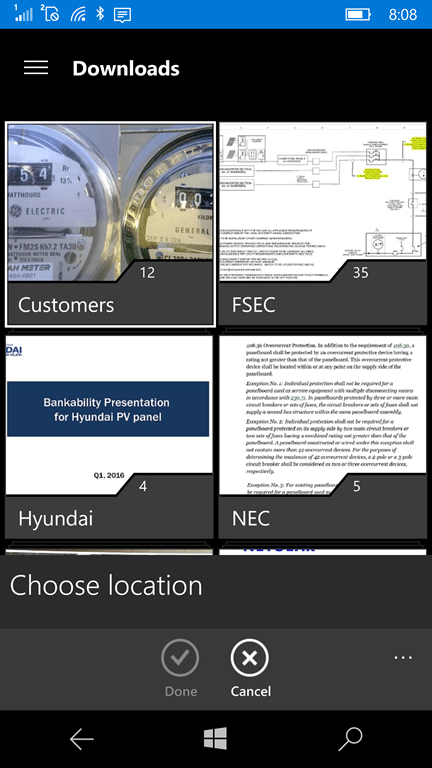 Microsoft has continually updated and improved their OneDrive app for both desktop and Windows Mobile. As of this month I have moved 100% of all my personal and work related files up to OneDrive, nearly 100GB, thousands of folders, and probably tens of thousands of files. I have embraced the Cloud. That’s a lot to sort through. So now I am relying on OneDrive more than every before. Between my personal and business accounts, I have 2.2TB of OneDrive space available, so this will only get more complicated. One of the many features I use very often on my WM is the ability to attach a OneDrive file to an email message. it’s typically a PDF file that my co-workers could find if they wanted to, but it’s easier to ask me to send it to them via my phone. My frustration sets in when I navigate to OneDrive and need to drill down to find a file. Once you get past the first folder tree, everything after that is displayed on my phone, and apparently on my desktop also, as thumbnails. Now thumbnails may be nice for photos, unless you have thousands and need to wait a minute or more for all of them to refresh before you can scroll. But PDF files, Word files, Publisher files, FOLDERS. Not very practical. To make matters worse, much worse, these thumbnails are sorted by, “who knows what”. On my desktop, it’s oldest first. On my phone, not sure. 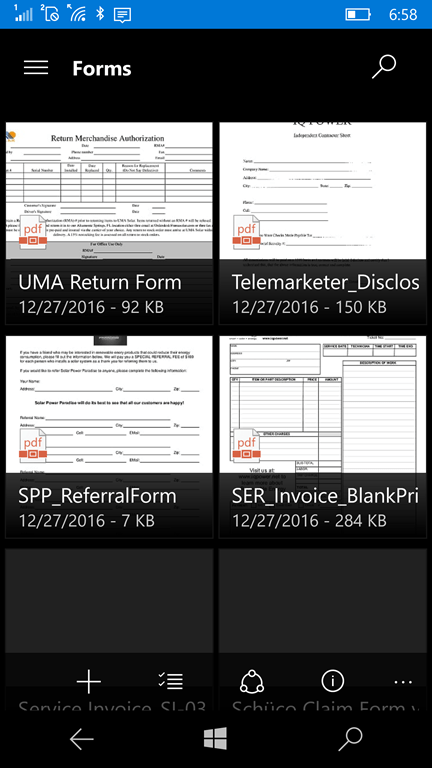 So here I am on my phone, navigating to My Work Files folder, only to be presented by a 100 folder thumbnails in some random order. I then have to search through all the thumbnails to find the next folder. And then onto the next folder tree to do the same again, and again. Till I finally get to a stack of PDF files, randomly sorted by thumnail, so I again have to search for a file that happens to start with the letter “A”. Why Microsoft, why? On my desktop, I open File Explorer and navigate to OneDrive. All the folders are sorted alphabetically by default. I drill down and each sub-tree is display by my preferred view, “detailed”, sorted alphabetically. 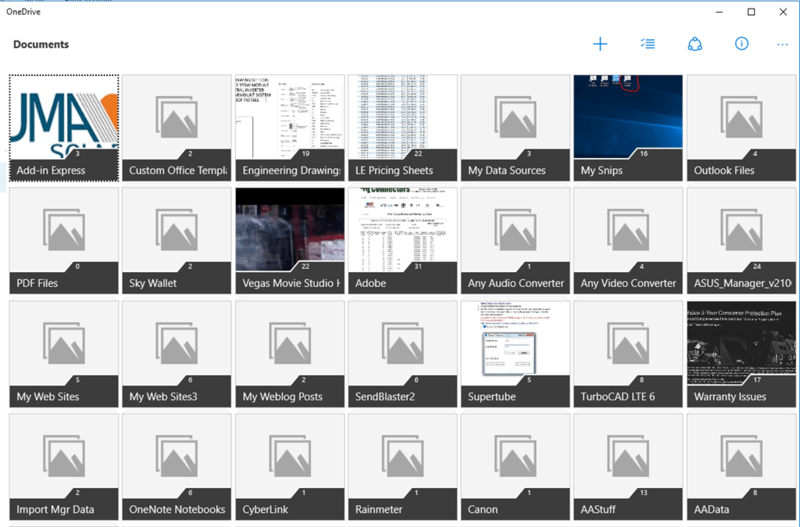 Why should the OneDrive app for Windows 10 and WM be any different? I thought this was much worse than it really is, but I did find a way to change the view in OneDrive on my phone and desktop. 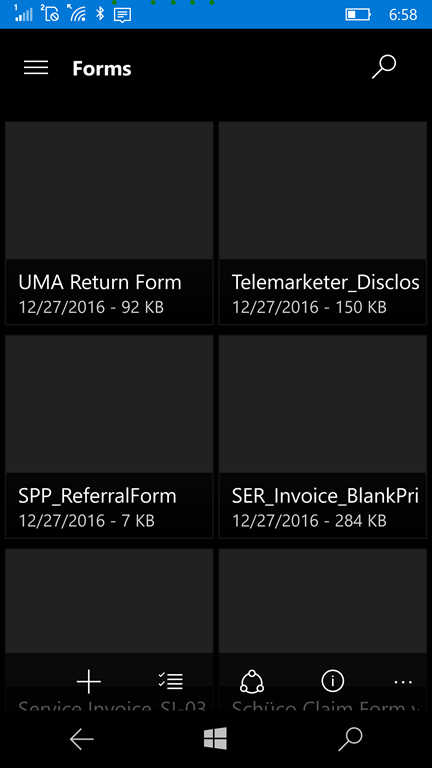 If you open the app, not navigate from Outlook mail, you can change the view of each folder, sub-folder, from thumbnail to list view. Then you can change the sort order from Oldest to Name Ascending, or several other choices. But, you need to do this for every folder and sub-folder, and sub-sub folder, etc. That’s hundreds and hundreds of folders. Those options though are not available when attaching a file. So you can’t fix the problem when you encounter it. You just have to deal with it. Oh, and making the changes on my phone does not transfer those preference to my desktop app. And as I only found this fix today, not sure if it will stick, or revert back to the default again. Maybe after one of the frequent app updates. 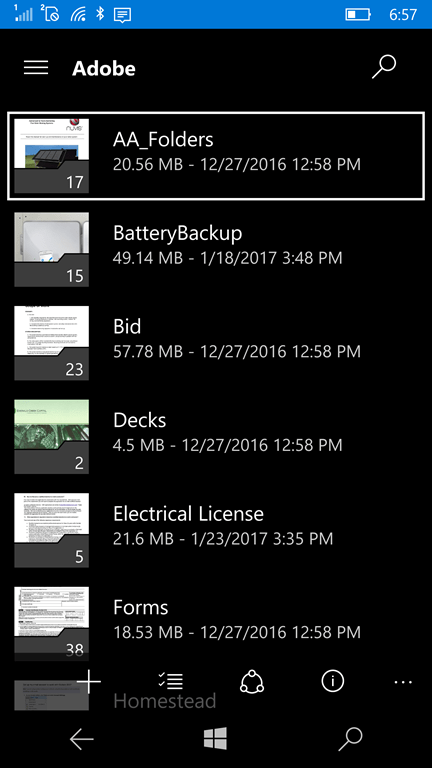 Why can’t OneDrive default to a more logical, alphabetical list view, with options to change it any way you choose? Or why can’t there be a global setting to change every folder and subfolder to a particular sort order and view? 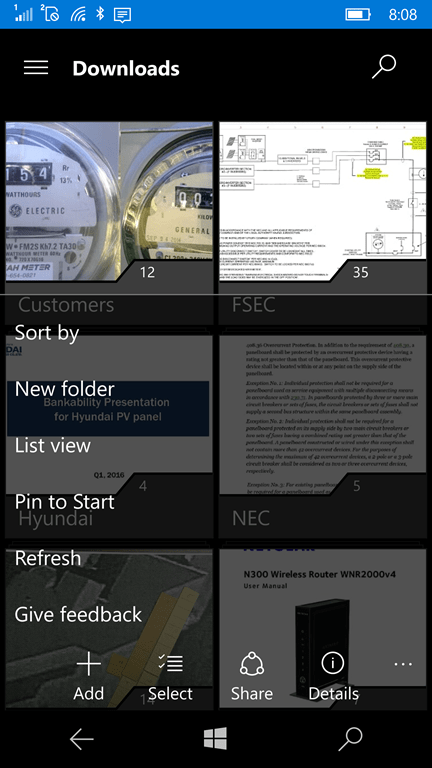 Then allow users to make changes to individual folders after the global change. Don’t these alternatives make more sense than the current, broken (whoops, that’s subjective) setup. If you have encountered this feature (there I go again) I’d love to read your feedback. Next articleWait, Microsoft has an App Store? Really!